For the tenth year in a row, attorney Bruce A. Hagen has been named to the Georgia Super Lawyers list. The 2015 award cites Bruce’s dedication to fighting for his clients, often bringing cases to trial when he feels an offered settlement is not adequate. 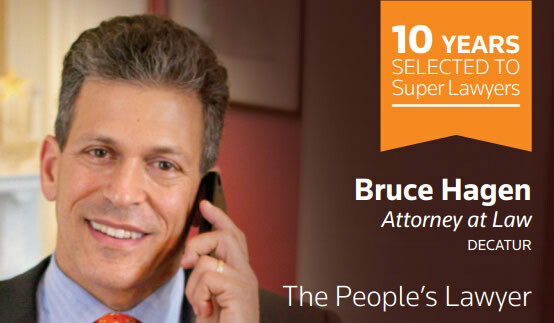 Known as The People’s Lawyer, Bruce is always ready to take on insurance companies to help his clients receive justice. Candidates for the Super Lawyers award are evaluated in a multistep process that focuses on their professional achievements, legal competency, and recognition by their peers. Making the list is a great honor, especially given that the state of Georgia has over 30,000 attorneys actively practicing law. Consistently earning a place on Georgia’s Super Lawyer list speaks to the credibility, achievement and professional standing of an attorney. Besides his firm’s combined 55 years of experience (comprising more than 10,000 personal injury cases), Bruce is active in the metro Atlanta community. A regular guest on Atlanta media outlets like 680 The Fan, Atlanta Eats TV and Atlanta Eats Radio, he also participates programs for bicycle safety and traumatic brain injury, having recently been appointed as a Board Member of the Brain Injury Association of Georgia. Bruce is the sole Georgia lawyer selected to be part of the Bikelaw network of lawyers around the country committed to representing bicyclists and advocating for laws protecting cyclists’ rights.Bruce belongs to the State Bar of Georgia, the Atlanta and DeKalb County Bar Associations and the American Association for Justice, and is also a Champion member of the Georgia Trial Lawyers Association. Bicycle Wrecks, wrongful death, vehicle accidents and premises liability are all cases that Bruce’s firm has handled successfully for his clients. Additionally, Bruce is representing hundreds of former NFL players in the Concussion Litigation against the NFL, which has resulted in a proposed settlement estimated to be in the range of $1,000,000,000. Congratulations Bruce on making this list for a solid decade!